Would you like a very versatile and comfortable shoe? Thanks to Luisetti this lace-up shoes, sober and very easy to combine, design not you put them in throughout the winter. By buying this product you can collect up to 350 loyalty points. Your cart will total 350 points that can be converted into a voucher of 2,80 €. This collection shoes Luisetti, are designed to offer the maximum comfort, manufactured with a flexible construction and very lightweight, designed for the urban man who needs to be many hours with them jobs, see in this model a shoe comfortable and classic, but without renouncing to elegance. -Brown, a vital wildcard for all your urban and casual looks. -Black, sober and classic, but essential in any masculine wardrobe. The outside of the shoe, is plush with a very soft suede, they are also very easy to keep clean, thanks to the water and dirt repellent treatment. With lining combined in warm textiles in the area of the fingers with smooth leather in the instep and heel, very breathable and comfortable area. It has padded leather insole and removable is to use your custom insoles. It has padded neck which ensures greater comfort in the heel area. The floor is injected polyurethane, with system absorbs impacts in the heel, and very light weight. Is it fastened through laces at the instep for a perfect fit. 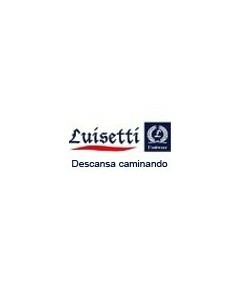 Designed and manufactured in Spain by Luisetti. The classical line of shoes Luisetti, is very versatile, and they are an ideal choice for travel or simply for everyday use, they are also exceptionally comfortable thanks to its lightweight and comfortable design. Do not hesitate, these shoes will be your best choice.